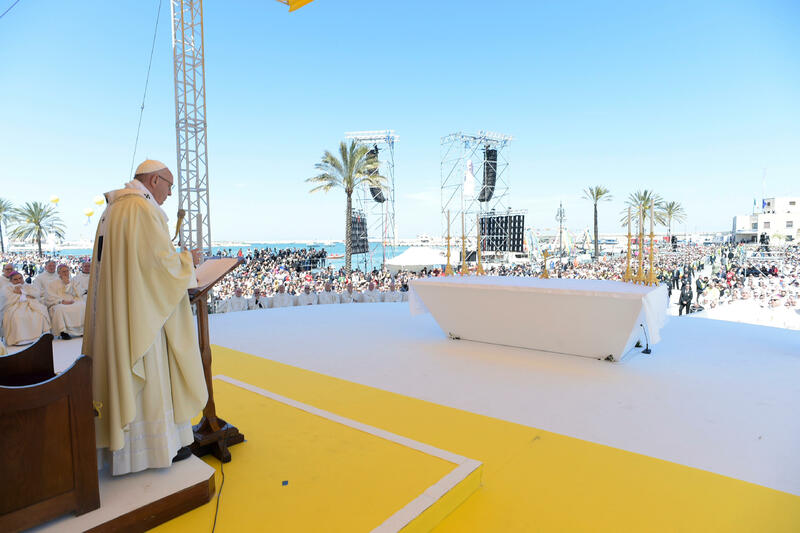 Pope Francis has visited the southern Italian towns of Alessano and Molfetta in Puglia to commemorate the 25th anniversary of the death of the popular Italian bishop Don Tonino Bello, remembered for his helping the poor, disadvantaged, and promoting peace. In 2007, the cause for beatification of Don Tonino, late bishop of Molfetta-Ruvo-Giovinazzo-Terlizzi, was opened. The readings we have heard present two elements central to the Christian life: the Bread and the Word. The bread. Bread is the essential food for living and Jesus in the Gospel offers Himself to us as the Bread of life, as if to tell us: “You can not do without me”. And he uses strong expressions: “eat the flesh of the Son of Man and drink His blood” (cf. Jn 6: 53). What does it mean? That for our life it is essential to enter into a vital, personal relationship with Him. Meat and blood. The Eucharist is this: not a beautiful rite, but the most intimate, most concrete, most surprising communion that can be imagined with God: a communion of love so real that it takes the form of eating. Christian life starts every time from here, from this table, where God satisfies us with love. Without Him, Bread of life, every effort in the Church is in vain, as Don Tonino Bello recalled: “Works of charity are not enough, if the charity of works is lacking. If the love from which the works leave is lacking, if the source is lacking, if the starting point that is the Eucharist is lacking, any pastoral commitment is only a stirring of things” . Jesus in the Gospel adds: “He who eats me will live for me” (v. 57). As if to say: who feeds on the Eucharist assimilates the same mentality of the Lord. He is Bread broken for us, and who receives it becomes in turn broken bread, which does not rise with pride, but gives himself to others: he stops living for himself, for his own success, to have something or to become someone, but he lives for Jesus and like Jesus, that is for others. Living for is the mark of those who eat this Bread, the “trademark” of the Christian. Living for. It could be displayed as a warning outside any church: “After Mass we no longer live for ourselves but for others”. It would be good if, in this diocese of Don Tonino Bello, there were this notice on the door of the Churches, to be read by everyone: “After Mass we no longer live for ourselves but for others”. Don Tonino lived like this: among you was a Bishop-servant, a Pastor who became a people, who in front of the Tabernacle learned to let himself be consumed by the people. He dreamed of a Church hungry for Jesus and intolerant of all worldliness, a Church that “knows how to perceive the body of Christ in the uncomfortable tabernacles of misery, suffering, loneliness” . Because, he said, “the Eucharist does not tolerate sedentariness” and without leaving the table remains “an unfinished sacrament” . We can ask ourselves: is this Sacrament realized in me? More concretely: Do I just like being served at the table by the Lord, or do I get up to serve like the Lord? Do I give in life what I receive at Mass? And as a Church we could ask ourselves: after so many Communions, have we become people of communion? The Bread of life, the broken Bread is indeed also Bread of peace. Don Tonino claimed that “peace does not come when one takes only his bread and goes to eat it on his own. […] Peace is something more: it is conviviality”. It is “eating bread together with others, without separating, sitting at the table among different people”, where “the other is a face to discover, to contemplate, to caress” . Because conflicts and all wars “find their roots in the fading of faces” . And we, who share this Bread of unity and peace, are called to love every face, to mend every tear; to be, always and everywhere, builders of peace. Together with Bread, the Word. The Gospel reports sharp discussions on Jesus’ words: “How can this man give us his flesh to eat?” (V. 52). There is an air of defeatism in these words. So many words resemble these: how can the Gospel solve the problems of the world? What is the use of doing good in the midst of so much evil? And so we fall into the error of those people, paralyzed by discussing the words of Jesus, rather than ready to welcome the change of life asked for by Him. They did not understand that the Word of Jesus is to walk in life, not to sit and talk about what is good and what is not. Don Tonino, precisely at Easter, wished to welcome this new life, finally passing from words to deeds. Therefore he gave a heartfelt exhortation to those who did not have the courage to change: “The specialists of perplexity. The accounting pedants of the pros and cons. Calculators, who exercise the maximum caution before moving” . Jesus is not answered according to the calculations and conveniences of the moment; He is answered with the “yes” of all our life. He does not seek our reflections, but our conversion. He points at the heart. It is the same Word of God to suggest it. In the first reading, the resurrected Jesus turns to Saul and does not offer him subtle reasoning, but asks him to put his life at stake. He says to him: “Now get up and go into the city, and you will be told what you must do” (Acts 9,6). First of all: “Get up”. The first thing to avoid is to stay on the ground, to suffer life, be gripped by fear. How many times did Don Tonino repeat: “Stand up!”, because “it is not lawful to stay before the Risen One other than on your feet” . Always stand up, look up, because the apostle of Jesus can not get by on small satisfactions. The Lord then tells Saul: “Enter the city”. Also to each of us he says: “Go, do not stay closed in your reassuring spaces, take a risk!”. “Risk!” Christian life must be invested for Jesus and spent for others. After having met the Risen One we can not wait, we can not postpone it; we must go, go out, despite all the problems and uncertainties. For example, we see Saul who, after having spoken with Jesus, though blind, gets up and goes to the city. We see Ananias who, though fearful and hesitant, says: “Here I am, Lord!” (v. 10) and immediately goes to Saul. We are all called, in any situation we find ourselves, to be bearers of Easter hope, “Cyrenians of joy”, as Don Tonino said; servants of the world, but resurrected, not employed. Without ever bothering us, without ever resigning ourselves. It is nice to be “couriers of hope”, simple and joyful distributors of the Paschal alleluia. Finally Jesus says to Saul: “You will be told what you must do”. Saul, a determined and affirmed man, is silent and goes, docile to the Word of Jesus. He accepts to obey, he becomes patient, he understands that his life no longer depends on him. He learns humility. Because humble does not mean shy or discharged, but docile to God and empty of himself. Then, even the humiliations, such as those experienced by Saul on the ground on the road to Damascus, become providential, because they strip away presumption and allow God to get up again. And the Word of God does this: it frees, raises, and keeps us going, humble and courageous at the same time. It does not make us established protagonists and champions of our own skill, no, but genuine witnesses of Jesus, Who died and rose again, in the world. Dear brothers and sisters, at every Mass we feed on the Bread of life and the Word that saves: let us live what we celebrate! In this way, like Don Tonino, we will be sources of hope, joy and peace. «Configurati a Cristo capo e sacerdote»,Cirenei della gioia, (“Configured to Christ, head and priest”, Cyrenians of Joy) 2004, 54-55. «Sono credibili le nostre Eucarestie?», Articoli, corrispondenze, lettere (“Are our Eucharists credible?”, Articles, corrispondence, letters) 2003, 236. «Servi nella Chiesa per il mondo» (“Servants in the Church for the World”) ivi, 103-104. «La non violenza in una società violenta», Scritti di pace, (“Non-violence in a violent society”, Writings of peace) 1997, 66-67. «La pace come ricerca del volto», Omelie e scritti quaresimali, (“Peace as the search for the face”, Lenten Homilies and Writings), 1994, 317. «Lievito vecchio e pasta nuova», Vegliare nella notte (“Old leaven and new dough”, Keeping watch at night), 1995, 91. Final greeting at the end of the Chrism Mass, 8 April 1993.